Carringtons Catering championed Liverpool with a locally sourced menu for the United Nation’s World Cities Day conference, which recently came to the city for the first time. The award-winning caterers offered hundreds of international delegates a true taste of the region at the global conference and dinner with a three-course meal to celebrate the city’s urbanisation and sustainable growth in the last decade. Organised by the United Nations Human Settlements Programme (UN-Habitat), Liverpool City Council and the Shanghai People’s Government, World Cities Day took place in St George’s Hall, whilst the formal dinner was held in the Anglican Cathedral. Director of Carringtons Catering Helen Wynn said: “It was incredibly exciting to be a part of this momentous occasion that brought together representatives from all over the world to discuss and promote the international community’s interest in global urbanisation. Liverpool was the perfect choice for this year’s conference, which centred around the theme ‘Better Life, Better City’ as it offers a prime example of economic and sustainable growth on a universal stage. 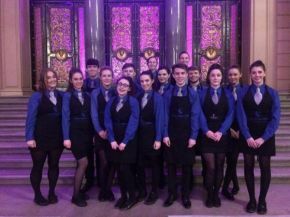 Carringtons Catering has previously catered for events such as the Capital of Culture Opening Ceremony, The Atlantic Container Line Launch, Common Wealth Games visits, the Hillsborough Anniversary Service and the arrival of the Three Queens into Liverpool’s docks. Helen added: “For us, this was not only a valuable opportunity for us to show off this city to an international audience, but it also allowed us to add in some of our own personality and really showcase our local knowledge with a team that is predominantly based within the region. With Master Chef of Great Britain Darren Wynn curating a delicious menu using all locally sourced products, we hope to have left our international guests with a lasting positive impression of what this region has to offer in terms of quality.